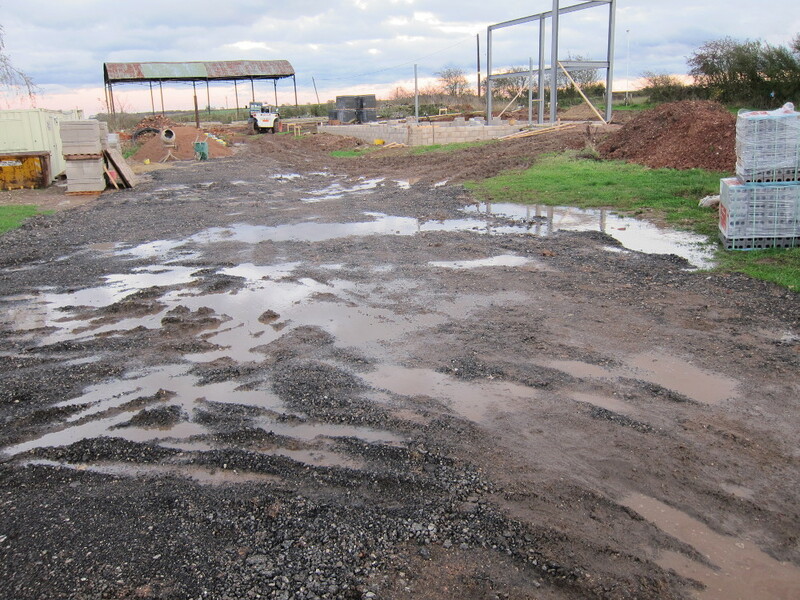 After persistent rainfall over recent days, including a heavy shower on Saturday morning, there’s a lot of standing water on the site and what was hard, dry red clay has turned into sticky, wet red clay in the GSHP collector trenches. It’s not a big surprise to me, having lived on-site for over a year now, but it reinforces the logic of placing the house where it is, 1m up above the dfiveway, and shows how important it’s going to be to effectively drain the driveway when the house is completed. The water level in the adjacent field drainage ditch is significantly (500mm or so) lower so it’s not as if the water table is at ground level. One consequence of having such large amounts of standing water outside on relatively warm but overcast days is that the relative humidity outside must be close to 100% and so the relatively humidity inside the caravan is also very high – often measured at 75% or more. I’ve borrowed a dehumidifier from a friend which has proven successful at reducing the relative humidity from 75% or more to 60% or less. Once it gets colder outside and I need to use more heating in the caravan it will stop being a problem. Another casualty of the recent high winds was my landline telephone connection. I was working in Reading on Wednesday when I got an automated “LINE DOWN” text message from my ISP saying my broadband line was down. (Kudos to Andrews & Arnold for their status monitoring and alerting service.) On previous occasions the connection has come back of its own accord, and a temporary power outage would cause the same symptoms, but after a couple of hours I hadn’t received the expected “LINE UP” message so I decided to investigate further. As reported previously I’ve been aware the overhead phone line runs through some trees along Aston Lane and it has previously been brought down, presumably by trees breaking the cable after being damaged by high winds or snow. As a result it wasn’t a complete surprise that a problem had occurred, though I would have expected it to happen during the worst of the storms rather than a couple of days later. I decided to contact the A&A Support folks for confirmation that there was indeed a line fault. They ran a further test (turns out I could have done that myself too) which confirmed there was indeed a problem with the phone cable, that it was affecting other phone lines as well as mine and that a repair was planned to be completed by midnight on Friday. So far so good. 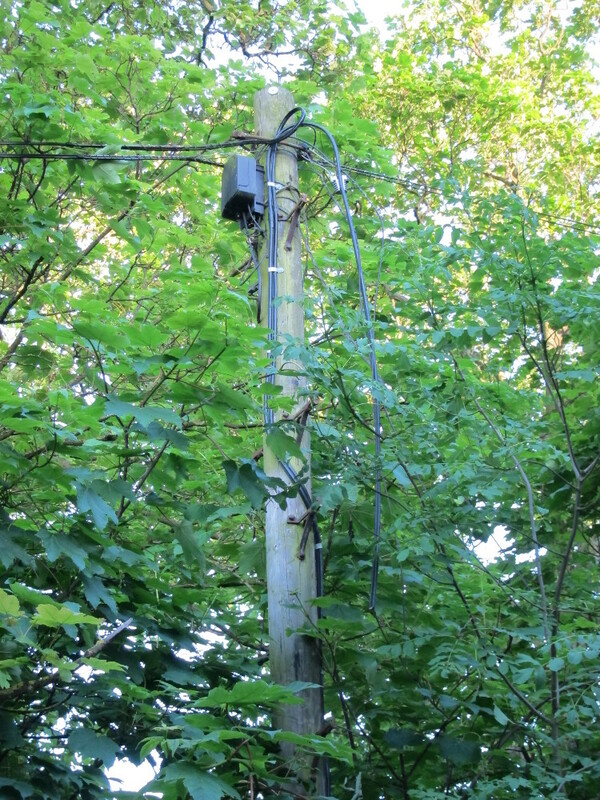 On Friday morning I got a call from A&A Support saying BT / OpenReach had actually taken a look at the damage and concluded they couldn’t fix it there and then but had to refer it to the ‘complex’ repair team who would have to install one or more replacement telegraph poles and then reinstate the cables. They predicted it would take a further week, i.e. not repaired until the following Friday. In the evening I took a walk up the lane with my camera to see if I could spot the problem (and any signs of a repair having been started) and sure enough there was a cable that I’m sure should have been connected between two poles which instead was dangling loose from the top of each of them. To my untrained eye it’s not obvious why the poles need replacing – there are others further along the lane which are in much worse condition and leaning at quite an angle – but there’s certainly a cable problem, and if the pole in the photo needs to be replaced then there’s quite a bit of re-cabling required since there are other cables branching off rather than a simple in-out connection.